Well, I must be doing something right because I've had a string of tactical victories so far. Got the achievement earlier that is awarded for having a 3:1 casualty ratio as well as the one for killing over 100 enemy soldiers in a single battle. The game is certainly aesthetically pleasing as well, and I really am enjoying the operational layer. Still struggling with some of the mechanics and tactical ai though. Progress is being made. What OP are you playing Capt? I'm doing the Raid DLC, mostly for the winter conditions. I just finished the first operation as the Germans, ending it with a "Draw." Not really sure why though, because as best as I can figure I achieved my operational goals of opening a corridor to the 320th ID and relieving them in place. I've started the second operation but I've only fought one battle so far. Slowly but surely getting more into it all. The victory conditions are one of the most arcane aspects of this series and something I also struggle to understand. You really can’t please your commander. I usually play with one victory condition...kill. I don’t always win, but it’s certainly always a good time. Agree with both. What I've ended up doing is interpreting the operational goals as best I can and then trying to execute them. This is partially helped by the on-map victory locations, though as I learned with the first operation, holding most or all of them does not insure a victory. In the first operation I was able to open a relief corridor to the 320th ID, hold it against Soviet counter attacks, and evacuate the wounded from the 320th. At no point did the corridor get cut off or closed by the Soviets, so even though the game told me I only managed a 'Draw," I'm considering it a win. I kind of like the wiggle room for interpretation with both the commanders intent for the operation, and the end results. I'm sure an interesting conversation could be had regarding the fog of war/friction of command and its (possibly unintentional) representation in the game. Another point is that I wish the operations were both larger and longer. The lack of an editor really hurts the game here in my opinion. I would love to be able to open up an editor and throw together an operation myself. Not sure if the length/size of an operation is limited by the game engine or if the developers keep them small for simplicity sake. Granted, I have not played all of the operations offered. Hey Cpt, I'm sorry if I missed it, but do you own the Black Snow dlc? I do not. The only DLC I have is the Raid DLC. I may end up getting some of the other DLC's at some point, but not until I have a better feel for the game. If you are looking for a larger campaign, and you prefer the snow maps (as I do) Black Snow would be a good step. The Russians are tasked with a breakthrough in an area not well suited for it. Heavily forested and strongly defended, mined, and manned, the 28 turn op is a slugfest. Not quite the deep snow as Raid but still dark and cold. I was thinking about the VC's in MF again and came to the idea that its ambiguity is something I like. You never know if youre doing quite enough. In my hex games of the past I always knew if I reach hex 39,68 by this time I would win. In MF, that certainty is not there. As far as a better feel for the game, I still have much to learn. I talk of this game as more of an advocate and fan than as an expert. It's mystic, often times unnecessary imo, is something I still struggle with. I'll definitely look into the Black Snow DLC when it's on sale again. Sounds like it could be very enjoyable. I agree that some ambiguity is nice, especially in Graviteam where it doesn't matter if you win or lose a campaign or not, you can still move on to the other ones. Graviteam Tactics Mius Front is releasing another DLC of a little known battle after the first of the year titled Under the Cruel Star. On the morning of February 20, the 11th Calvary Division of The 6th Guards Calvary Corps received the order to attack Ordivka and Bulakhi farmsteads(fst). They were not able to accomplish the task, and by the evening withdrew to fst.Klyuchevodsk where they were on the defensive until February 20-21. The 83rd Calvary Division conducted a battle for the village of Borki for two days but were only able to position themselves on the heights north of the village. Things turned worse by the evening of the 20th when they were dislodged from the heights and forced to fall back and entrench in the forest. The next day the cavalrymen attacked Borki again, but were able to capture it only by the morning of February 22. The same day the 11th CD reached fst.Podkopay and fst.Homenki again, and attacked in the direction of fst.Ordivka and fst.Bulakhi. By then, units of 1st SS Panzer Division Leibstandarte SS Adolf Hitler took defense here. Two operations consisting of 10 turns, one from the Soviet perspective and the other as the Germans in the area of Farmstead Bulakhi, February 23-24, 1943. 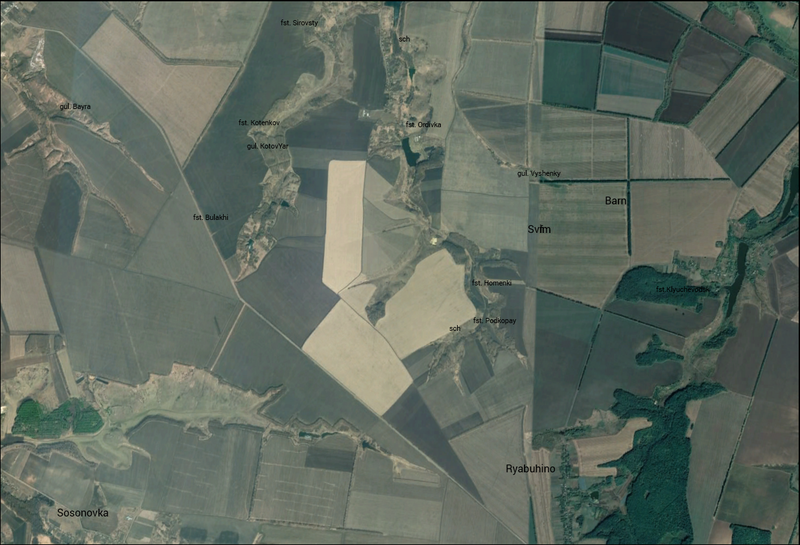 Battle area of over 48 sq.km that include farms, windmills and extensive gullies. Historical organizational structure of the units at the time of the offensive. I so appreciate playing these virtually unknown battles that MF features. Here is a Google Earth screen I took of the battle area in current time while looking for source material. Thought I'd share. Near where the defunct Farmstead Bulakhi once was stands a mass grave and monument to the soldiers that died fighting in the area. It is located at 49°41'06"N 35°56'02"E . By the way, Borki would be located off the top right corner of the map. That looks very good. I just bought the Tunisian game and trying to figure things out. I wish the tutorials were better. Is there a thread for that game? I don't think there's a separate thread for Tunisia but everything that is applicable to Mius Front is applicable for Tunisia. I own it but since I'n not a huge fan of desert warfare I haven't invested much time into it. From what I remember the battles are huge, which could easily lead to confusion. Have you tried the Come Into Battle Mode? It is the button on the bottom right of the menu screen and with it you can set up a small battle that uses a simplified order system to get familiar with the game. Most of it is intuitive and I would suggest a try and fail approach. If you have any questions feel free to ask. I would say the most difficult aspect is the reinforcement phase and how to work it followed by indirect fire from mortars, artillery and guns. Certain conditions must be met to execute those orders that arent very clear. The tutorials, from what I understand, leave something to be desired. Part of the problem is clearly the language barrier of the developers. Secondly is the fact that it's a small team with limited resources. Excuses? Possibly. But these are the facts of the day and those that stick through and learn the system are rewarded with one of the best tactical experiences to date. Lastly, just go with it and have fun. You don't need to know everything. And possibly turn of the Improved Orders System in the options menu. This will make it easier for newer players. Thanks Moreb for the advice. I tried it and I had Operation Star but too clunky.